Again the idea for this week’s Blog came from a friend who asked me whether I thought she was too old to train to be a Yoga teacher. My reply was “absolutely not”. I have attended many a yoga class where the instructor was well into their 80s and they were so much more flexible than me. Indeed, there are many yoga teachers out there in their 90s. Tao Porchon-Lynch is one of these teachers, she is 95 years young and not only a yoga teacher but competes in ballroom dancing and is regularly placed first, she is also a wine connoisseur and a peace activist. In an interview on You Tube she said “nothing is impossible”. Her advice is “don’t procrastinate”. Good advice. Every morning when she wakes she thinks about the birds, nature and how beautiful everything is. Nature is her encyclopaedia of life and there is no room for negativity. What a wonderful way to start the day, not to think about any negative thoughts and to focus on the beauty around us. In fact, I would go one step further and say we should start and finish everyday with happy thoughts. I know I do. I think of my own grandmother who is featured in the photo and is also the same age as Tao Porchon-Lynch. She was born 5 days before the end of the First World War. She is fortunate enough to still live in her own home, she does her own cooking, cleaning and shopping and until a few years ago grew her own vegetables. Every week she has her hair done, she still takes pride in her appearance. She exercises daily and has done since I can remember. She tells me that this keeps her mobile and helps to stop her muscles from ceasing up. Our bodies in our 90s do not produce new cells so it is very important to keep the current ones healthy. My grandmother has never driven and as well as walking, she cycled until her late 70s. I believe all these things have helped contribute to her longevity and her zest for life. She takes an active interest in what’s going on in the world and is always happy and smiling, never once complaining. She still has an amazing enthusiasm for life and remains energetic. 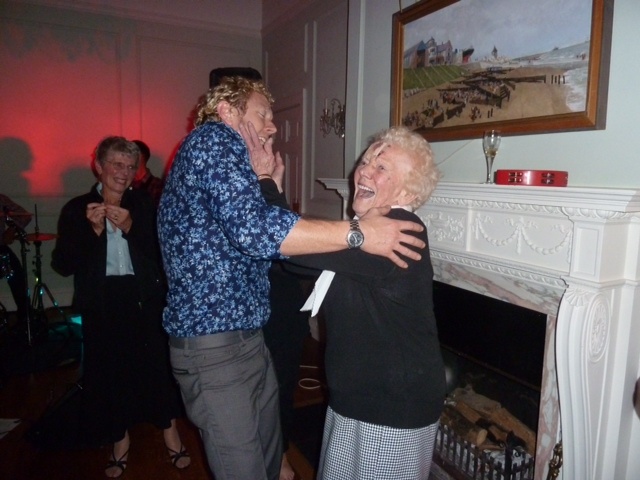 At my recent birthday party, she danced for most of the night, despite having had a growth cut out of her forehead a few weeks previously. Nothing was going to stop her and she even out danced most of the younger guests. Another friend’s grandmother was recently described “as a fighter” following a bad fall. So what is it that gives these ladies their energy, enthusiasm, true grit and fighting spirit? When I stop to think about what they have been through, it becomes a little bit clearer. Their husbands were sent off to fight in World War Two, invariably leaving them home with young children. When the bombings started, some children were evacuated to the countryside, Wales or Ireland. My father and auntie were shipped off to Ireland. Imagine, not only having to say goodbye to your husband not knowing if or when you would see him again but then having to wave your children off, and in some cases, handing them over to complete strangers. Our grandmothers then went out to work for the war effort, usually working in factories, munitions plants, farms and some also drove trucks. They just got on with it and never once complained. The only means of communication was the good old-fashioned letter which when received was usually out of date. There was no TV to broadcast 24 hours news, mobile phones, or Skype. When I think about what they went through, it is hardly surprising that they have such a true sense of spirit and I know this is what has made these women determined, strong and an inspiration. Hopefully we will never have to go through what they did but we can show our gratitude to them by loving and enjoying life and never giving up when things get a little bit tough. I think we can learn a lot from this older generation. And next time someone says they are too old to do something, remind them that age is just a number because you’re never too old. Learning new interests, being creative or active help contribute to a healthy mind and body. Laugh, Smile & Be Happy – All of your Life. Last week someone commented on my Blog about animals possibly being angels in disguise. 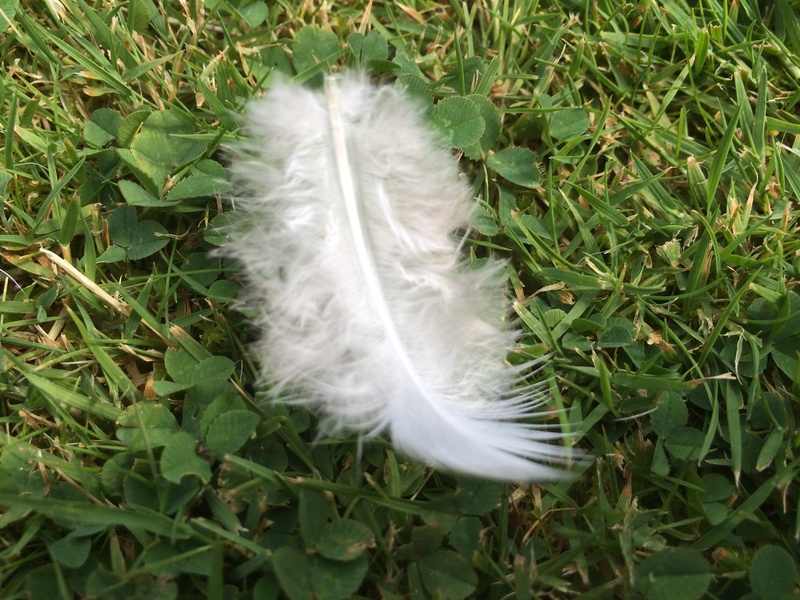 Whilst I was deciding whether or not to write this particular Blog and contemplating if it might be a bit too far “out there” for some, a white feather appeared from nowhere. This is the calling card of Angels. At that point there was no doubt in my mind that it was time to write about Angels – after all, it is the third word in the title of my Blog. I’ve always regarded myself as spiritual, especially since the death of both of my parents. I wasn’t with them when they passed away but I know the exact moment they did because they came to say goodbye to me. When my father passed away I saw hundreds of star like shapes in front of my eyes. It felt very strange, my vision was okay and I didn’t feel dizzy, it lasted for about 30 seconds. Thirty minutes later I received the call that my father had passed away. When my mother passed away, I recall going to bed and just as I was dozing off, I saw a huge white flash of light, it seemed to come out of nowhere and sped through the room. I didn’t think anymore of it until my phone rang ten minutes later. I said “she’s gone hasn’t she?” My brother’s reply was yes. Although both parents have gone physically I feel their presence around me all the time. I don’t feel that I have lost them. In fact, I feel extremely close to them and feel they are looking out for me and guiding me. It is said that everyone has a guardian angel / spirit guide who stays with us from the moment we are born until we die. They do not interfere with our everyday life and cannot make decisions for us. It is said that most spirit guides are deceased loved ones, such as grandparents, siblings, beloved friends and parents. For a long time I have felt that my dog, Alfie, who I introduced everyone to in last week’s Blog, has been sent by someone to look over me. Now I know this might sound ridiculous to some, especially as he can’t do anything for me. However, he can ward off potential burglars just by growling and barking. I am sure if there were a fire during the night he would find a way of alerting me (even though I have a fire alarm). When he looks at me he seems so wise and I have often wondered if he could be the spirit of one of my Grandfathers as I never met either of them. Whilst Angels don’t interfere with our everyday life, it is thought that they can sometimes avert a tragedy. Last year I was horse riding in Brazil. We stopped to allow our horses to drink at a small watering hole. I moved over to allow another horse and rider to squeeze in. As my horse moved away from the centre, the surface was muddier towards the edge and was like quicksand and my horse started to struggle. He sank deeper into the mud until he could no longer stand up. As he fell backwards it became obvious that I was going to be underneath him as he fell. I had nowhere to go and remember thinking this is it! However, my Guardian Angel had other ideas, because as I fell and the horse fell on top of me, the surface underneath me caused me to sink deeper and it created a soft space between us and although I could feel the horse’s weight on top of me it didn’t hurt. The horse scrambled to his feet and managed to get himself out. Then it was my turn to get out. It is harder with only two legs but with the help of my riding companions I got out. I was covered in mud from head to toe. Miraculously I had no broken bones or cuts. My horse unfortunately had a cut on his leg but I am pleased to say he was okay. I truly believe my Guardian Angel was taking care of me. I appreciate this might be a little too much for some of my readers to take in, but if we keep our thoughts open our Angels will make their presence felt. I would love to hear from you and if you have experienced anything similar or your thoughts about Angels. Wishing my lovely readers a happy, love filled and angelic week. 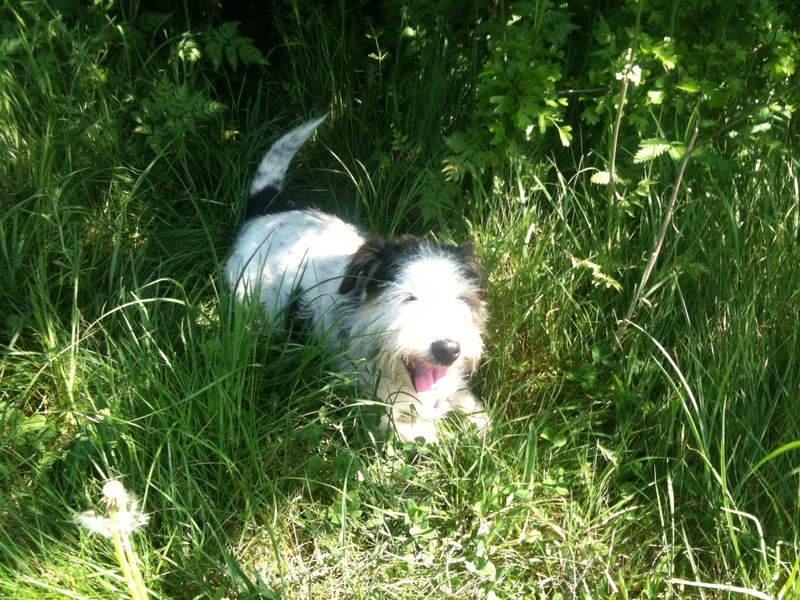 So the saying goes, however, this week I’ve decided to write about “a man’s best friend” and the simple pleasures and positive effects that owning dogs and other animals can bring to our lives. My “best friend” is Alfie who has been with me since he was 8 weeks old and yesterday it was his 13th birthday. During that time he has seen me through some pretty tough times. Obviously he can’t talk to me like my friends and family can but having him around through difficult times had a positive influence on me. His mood is always consistent – happy. The greeting he gives me when I have been out, regardless of whether I have been 30 minutes or 6 hours, is exactly the same, one of pure happiness. Every morning when I wake up he is raring to go, there are no bad days, just happy days, as his wagging tail will testify. His love is unconditional. Apart from the obvious pleasures that owning animals bring there are also many health benefits. Stroking a pet helps reduce stress and can help to lower blood pressure. Studies also show that owning a dog or a cat reduces the chances of cardio vascular disease. It is also believed that children who are exposed to pets early in their life have a lower risk of developing allergies or asthma. Children also learn about responsibilities if they help to look after an animal. They are usually able to look after a hamster or guinea pig quite easily as they do not require any exercise. Another benefit of owning an animal is they can help combat loneliness, especially in later years if a partner is left on their own after the death of a spouse, whether someone has a dog, cat, goldfish or hamster they will require feeding and a routine. I recall reading about a couple who had lost their son in a tragic accident. He had owned a few horses. They couldn’t bring themselves to sell them so decided to keep them and found that just by following their daily care routine of mucking out, changing water, feeding hay etc they still felt very close to their son. It helped them through their grieving process and gave them a purpose. It has been well documented that people who have dogs lead far healthier lifestyles than people who don’t. One of the main reasons is people who own dogs take regular daily exercise. Come rain, hail or snow a dog requires exercise and will want to go out. There is also the social side of owning a dog and I have made many good friends over the years. It’s amazing how dogs are natural ice-breakers, dog owners usually know the dog’s names before their own and then as time goes by and friendships blossom, they discover each other’s names. More and more hospices are allowing animals to visit terminally ill patients as they believe that petting a cat or dog can raise levels of serotonin and dopamine which are the “feel good” chemicals which in turn can help ease pain. Sadly, some people would like a dog but due to lifestyle or work commitments it is not possible but there are still ways to be around animals and share some of the benefits they can bring. There is a very worthwhile charity called the Cinnamon Trust (www.cinnamon.org.uk) whose primary objective is to respect and preserve the treasured relationship between owners and their pets. It provides a national network of over 15,000 volunteers to provide practical help when any aspect of day to day care poses a problem, for example, walking the dog for a housebound owner. Imagine what a wonderful act of kindness this would be. Alternatively, there is a company called “Borrow my Doggy” which introduces dog owners to trusted local dog borrowers/walkers. So it is still possible to experience the health benefits, joys and happiness that dogs can bring without having to own one. I would be very interested to hear about your animals and how they bring love and happiness to your daily life. Wishing all my readers a happy and love filled week.